The following is a transcript of prepared remarks delivered by the U.S. Army North Commander in closed session to the National Commission on the Future of the Army (NCFA). First off let me just say thank you for giving us the opportunity to convey the vital missions and responsibilities the Total Army performs in the Homeland. The Army has greatly advanced its posture to respond in the Homeland. In a time of persistent conflict, our Army leadership acknowledged the need and established a dedicated Army headquarters whose singular focus is the Homeland – U.S. Army North (ARNORTH). And given the nature of the Homeland environment – DOD would be in support of another Federal Agency – established standing Defense Coordinating Officers (DCO) embedded in each of the ten FEMA Regional Headquarters. These two major changes to Homeland response has ensured there is Army effort honed in on ensuring we are as much prepared to respond in the Homeland as are the other ASCCs in their Geographical Combatant Commands AORs. And it has greatly enhanced North American Security especially with our southern partners – Mexico. The Role of the Army in the Homeland. Homeland Defense is DOD’s #1 Priority and any response in the Homeland that incorporates a Military response will likely become the singular focus of the Nation’s leadership and the media. 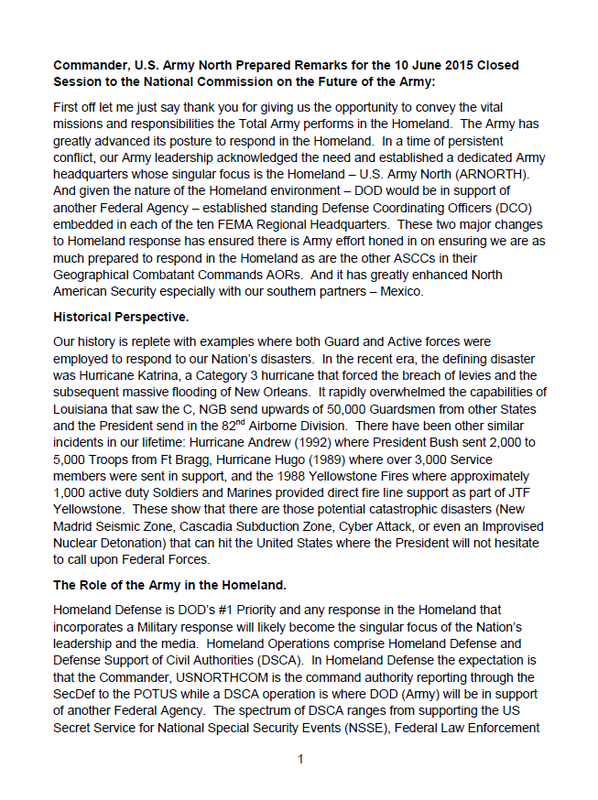 Homeland Operations comprise Homeland Defense and Defense Support of Civil Authorities (DSCA). In Homeland Defense the expectation is that the Commander, USNORTHCOM is the command authority reporting through the SecDef to the POTUS while a DSCA operation is where DOD (Army) will be in support of another Federal Agency. The spectrum of DSCA ranges from supporting the US Secret Service for National Special Security Events (NSSE), Federal Law Enforcement Agencies in Counterdrug and Border Security operations, FEMA for natural and man-made disasters (to include the extreme complex catastrophes), to the most dangerous a Chemical – Biological – Radiological – Nuclear (CBRN) incident. Recent examples include: providing Navy divers to recover the remains in the IH35 Bridge collapse, establishing housing at three separate DOD Installations for unaccompanied children coming into the US from our Southern border – in support of the Department of Health and Human Services (DHHS), and forming and training two EBOLA medical teams that could be inserted into any US hospital to assist in the care of infected patients – DHHS. 1. The Role of the Federal Force. How in DSCA through the Department of Homeland Security’s guiding doctrine, the National Response Framework, the State led response and the Federal led response achieve unity of effort and that through this all compos have a major role given their current structured capabilities. 2. Secondly, in that same vain, I will stress the criticality of retaining a DoD CBRN Response Enterprise – trained and ready to respond – dedicated to that specific scenario. 3. Lastly, I will show the strategic linkage to North American Security being fostered by having a dedicated Theater Army headquarters in the homeland. The Federal response in DSCA. If due to deployments or other readiness concerns any of these capabilities are not fully able to meet the Governor’s response plans, the Adjutant general can turn to his fellow states in an Emergency Management Assistance Compact or EMAC to gain the additional capabilities and fill his gaps. This is a co-share between the Governors for the utilization of these capabilities but it does keep the response within a Governor’s authority and does not elevate a request to the President to invoke the Stafford Act. However as shown as recent as Super Storm Sandy, where a specific capability – dewatering pumps were requested, the active and reserve forces became the source to fill the gap. The National Response Framework (NRF): Is the Department of Homeland Security’s guide to how the Nation responds to all types of disasters and emergencies, the typical incident response begins with first responders (e.g., police, fire, medical) at the local level. If first responders are unable to contain an incident, they may ask for assistance from their county emergency managers. When local jurisdictions cannot contain an incident, the Governor can declare a state of emergency and invoke the state’s emergency plan to augment individual and public resources as required, which typically include National Guard forces (Army and Air Force) on State Active Duty. Should requirements exceed state response capabilities or capacity, the Governor can use Emergency Management Assistance Compact (EMAC) agreements to request resources from other states. If requested resources are unavailable or requirements exceed capabilities, the Governor may also request federal assistance. If the response proceeds to the federal level, including a Presidential major disaster or emergency declaration, DOD (T10) forces may be deployed to support civilian efforts. The conduit for integrating DOD (T10) capabilities is the Defense Coordinating Officer (DCO) and their Defense Coordinating Element (DCE). These small 9-10 person all Army teams led by a former Brigade command or equivalent Colonels are assigned to ARNORTH but perform their day-to-day duties co-located with each of the 10 FEMA Regional Headquarters. Pre-activation they closely work with their Federal partners as well as with the State JFHQs and State Emergency Managers within their region to develop likely DOD (T10) requirements for State and regional plans in order to anticipate and ensure DOD (T10) won’t be late to need. When activated they directly represent the SecDef and work with FEMA’s Federal Coordinating Officer (FCO) to determine the feasibility of DOD (T10) supporting a request for assistance and then once determined expediting that request, now termed a Mission Assignment, through for SecDef approval and follow on sourcing by the Joint Staff. They are also the conduit within their region for any other request for assistance by other Federal Agencies (EX: US Secret Service for the UN General Assembly). Under their Operational Control are the 173 US Army Reserve Emergency Preparedness Liaison Officers (EPLO) located two per State and a five person team at the FEMA Regional Headquarters. These Drilling Reservist are the Subject Matter Experts (SME) for their state. Under the OPCON of the fulltime DCO/E, the EPLOs become a valuable extension that when an incident occurs are activated and seamlessly integrate into the DCO’s operations providing situational awareness at the State. DOD (T10) provides support when requested by civil authorities and approved by the SecDef. However, there are several separate authorities whereby DOD (T10) resources may be provided without SecDef approval. These are Immediate Response Authority (IRA), Mutual Aid Agreements/Memoranda of Agreement (MOAs)/Memoranda of Understanding (MOUs), or in accordance with the Chairman of the Joint Chiefs of Staff (CJCS) DSCA Execution Order (EXORD). Immediate Response Authority. DOD (T10) response at the municipal, county, or tribal level is provided initially under IRA. If requested, any commander can provide resources to save lives, prevent human suffering, and mitigate great property damage in response to a request from a civil authority, under imminently serious conditions and if time does not permit approval from higher authority. There is an unofficial time limit of 72 hours for immediate response operations. The 72 hours corresponds with the time limit for the response phase (focus is on life-sustaining functions) of a DSCA operation. CJCS DSCA EXORD sets the framework for resources and authorities provided to the supported combatant commander to conduct DSCA operations for actual or potential domestic incidents within the combatant commander‘s area of responsibility. The authorities granted by the EXORD are specified in four distinct categories of authorization: assigned forces, pre-identified resources, resources for internal use, and large-scale response categories.